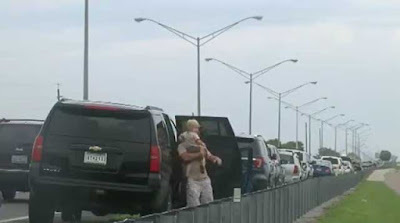 A rare sight literally stopped traffic on the Courtney Campbell Causeway in Tampa Bay, Florida, on Tuesday afternoon. There was a lot of splashing in the water just yards from the road and it drew dozens of people out of their cars to catch a glimpse of what is called a "manatee mating ball." People stopped to watch for good reason because it is a very rare sight that you can only see every 3 to 5 years. For a female manatee, deciding between suitors can be difficult. There are at least seven male manatees competing for a single female's attention. The male's strategy is to push the female into shallow water in order to mate with her. People complain about women breastfeeding in public, but take their kids to see animals mating. I'm just pointing out the irony.